Comprenew is pleased to announce a significant expansion into the Upper Peninsula of Michigan and Northern Wisconsin, which will provide proper electronics recycling services to people in those communities. Comprenew serves corporations, municipalities, and individuals through the collection, refurbishing, and recycling of used electronics. They are certified to the highest data security, environmental, and health and safety standards in the world relating to used and surplus electronics. Comprenew is the only e-Stewards certified company headquartered in Michigan and the only non-profit electronic recycler and refurbisher in the world certified to both the e-Stewards and R2 standards. Their retail locations provide warrantied refurbished products while serving as convenient places to drop off electronics for data destruction and proper recycling. Comprenew strives to demonstrate that people who traditionally have barriers to employment can perform at the highest standards given the right training and environment. Comprenew operates three social programs that improve access to information technology, provide work experience, and offer service learning programs for corporations, community groups, and schools. This geographic expansion builds on the strength of Goodwill of Northern Wisconsin and Upper Michigan (Goodwill NWUM), one of 155 independent Goodwill organizations. 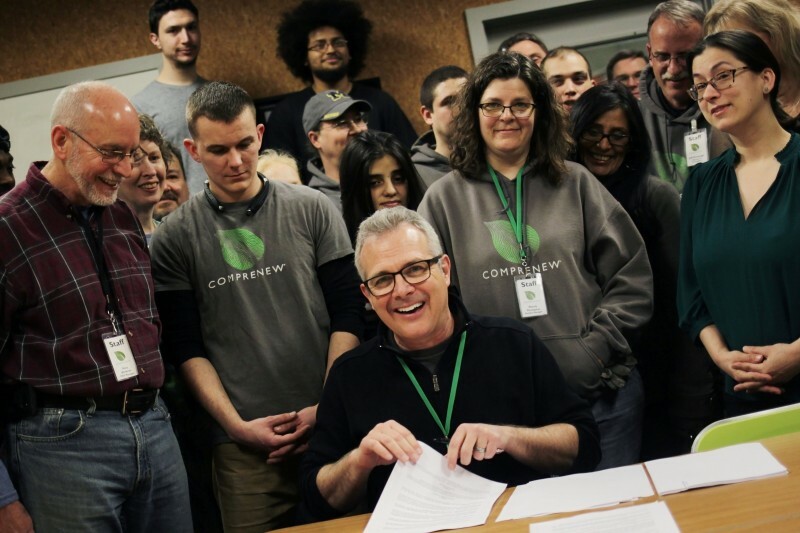 By partnering with Goodwill NWUM, Comprenew is able to expand electronics recycling and refurbishing services to the area through the development of retail stores, e-waste drop-off locations and a processing center. Goodwill NWUM currently operates six retail stores and two training centers covering the territory, along with a logistical collection fleet. Comprenew will be able to use Goodwill NWUM’s existing infrastructure to keep cost affordable and service efficient for the community. Goodwill NWUM and Comprenew have a shared mission to provide job opportunities to people who experience barriers to long-term employment, while inspiring environmental stewardship. This makes for a perfect partnership opportunity to expand into the Upper Peninsula of Michigan and Northern Wisconsin.